I crave him. I need him. I love him. These coat-style pajamas feature a cartoon print. The fabric is brushed polyester and flame resistant. They are loose and comfortable. Angel Dear muslin, to soothe and cuddle your baby with ease and comfort, an ancient tradition perfected for modern babies. Made of 100% pure cotton muslin, prewashed for softness, suitable for all seasons. Our swaddle blanket is sized to “grow with” baby for a custom fit every time. Size: 47″ x 47″. An absolutely gorgeous Flower Girl dress for your toddler or little girl by Kids Dream. This sleeveless dress has a stunning sequined bodice with a double layer of mesh. Comes with an elegant tow toned flower applique on the sash at the waist. The perfect dress for any special occasion. Not just for legs. Try them as arm warmers too! Measure approximately 12 inches long. One size fits most, infant to child. 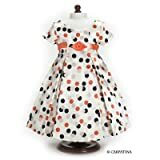 Satin dress with fun polka dot print and rose decoration. Completely lined.Tulle underskirt and snaps closure. 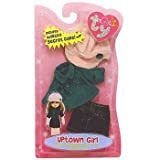 SB0039 Features: -Doll dress.-Playful peach pink and black dots deck this silky three-quarter length dress.-Bodice corsage, pink sash, and tulle underskirt add to the charm.-Dress closes at back with snaps.-Fits 18” American girl dolls.